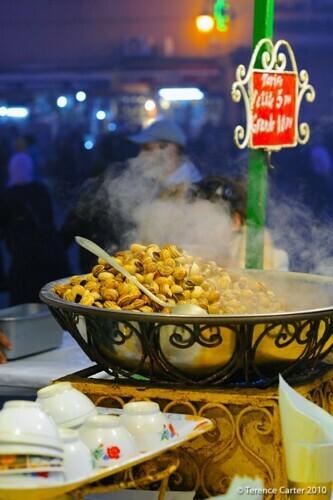 Where to eat on Djemaa Al Fna, the main square of Marrakech, can be overwhelming and intimidating if you aren’t familiar with Moroccan food, and aren’t prepared for what to expect from the magical yet chaotic main square that is the local’s nightly amusement park. 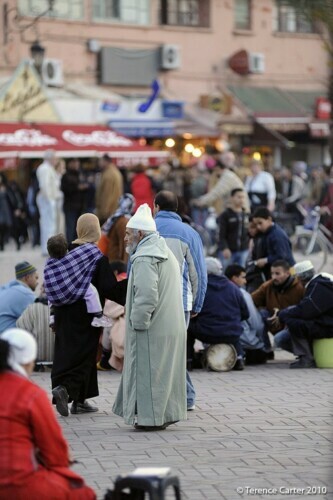 The main square of Marrakech, the Djemaa Al Fna, or ‘la place’, magically manages to simultaneously be the city’s major tourist attraction and the local’s nightly amusement park. An evening spent here is an addictive assault on the senses, so don’t be surprised if you find yourself returning night after night for more. 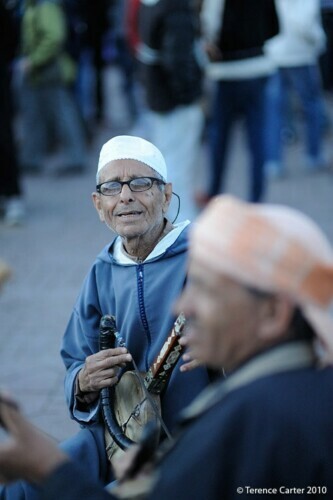 Local entertainments, including eating Moroccan street food, watching amateur boxing matches, bowling with Coke bottles, and, in Arabic only, listening to traditional storytelling and fortune telling, sit comfortably beside tourist-driven amusements focused on the photo opportunity. 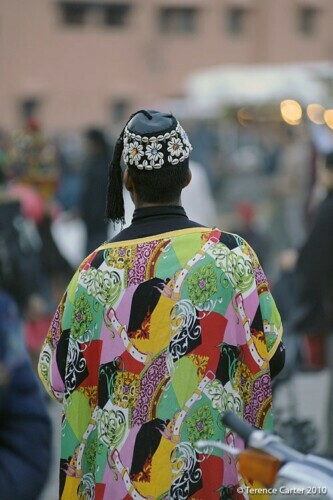 Imagine: cross-legged horn-blowing snake charmers, guys eager to have you hold their spirited (albeit shackled) monkeys, women who’ll paint henna patterns on your hands, and gnaoua musicians who like to place silly hats on your head in between performances. All for some dirhams of course! 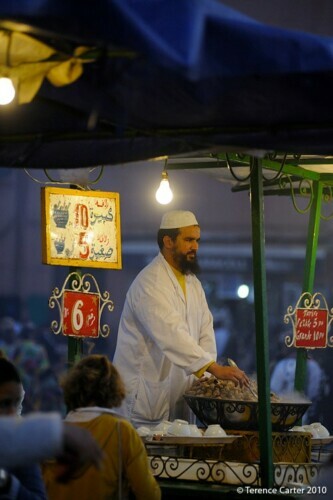 Djemaa el Fna, Marrakech, Morocco. Copyright 2014 Terence Carter / Grantourismo. All Rights Reserved. 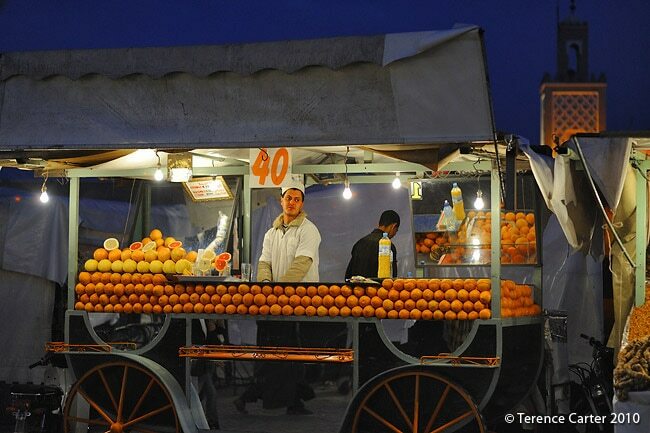 The Djemaa Al Fna, the main square of Marrakech, is the first point of call for travellers to the city who buy freshly-squeezed juices from the wagons piled high with oranges before making their way to a ‘panoramique terrasse’ to watch the guys cart their portable kitchens out to the square to set up for the night – a spectacle in itself. 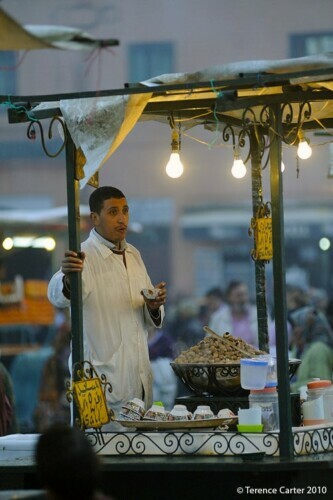 Then it’s back down to the square for some photo ops, and perhaps have some henna done, before surrendering to one of the stall touts, and tucking into some fried seafood or grilled meat on a bread roll. Locals hit the square later, after the sun goes down, and listen to a storyteller or musicians, have their fortune told, buy bags of fresh nuts or dried fruit, or simply have their shoes cleaned, before perching themselves onto stools for bowls of escargots and more adventurous fare, including all kinds of offal and the infamous sheep heads. 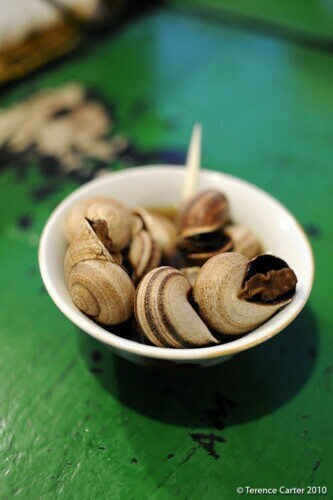 Start with a dish of tasty escargot at stand #6 from the big guy with the bushy beard; throw your shells into the plastic container and drink the delicious broth at the end. 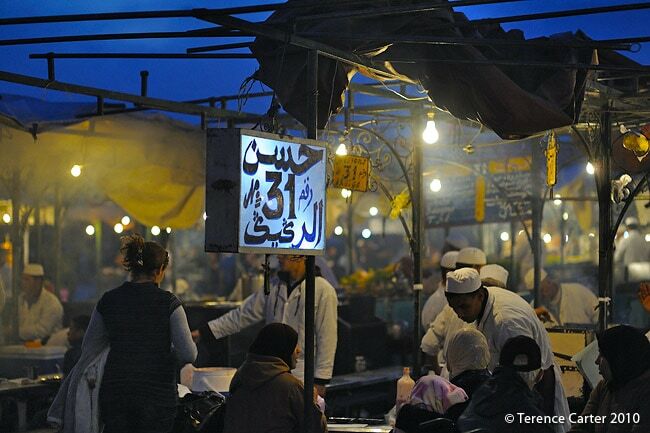 Follow this up with a bowl of hearty harira soup, eaten with a big wooden spoon at stand #5. Rob from Dar Rocmarra likes the fried fish from stall #115, but we recommend the merguez sausages and grilled meats from ‘Hassan’; look for the cloud of smoke and the red sign (he’s opposite the escargot guy). If you have room, try both. 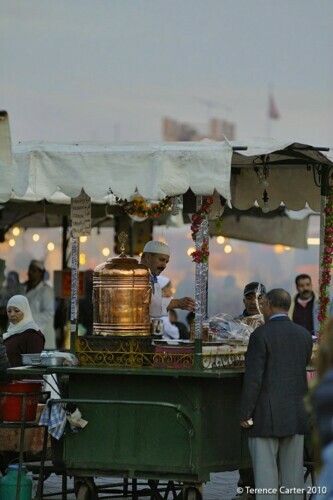 For dessert, head to the row of tea stands for a mint tea and pastries although we love the pungent spice tea, heady with ginseng, ginger, cinnamon and other spices, and always have a couple of glasses each as we survey the action on the square. 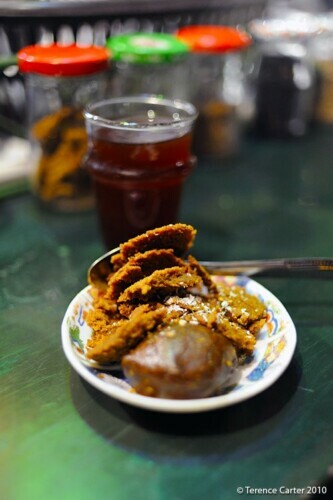 Locals will also have a dish of spice cake. Although the texture is a tad too dry for our taste, you should try it once. Our favourite tea guy, pictured above, is second from the left (there are only four of them); he’s the one with the sweet smile. 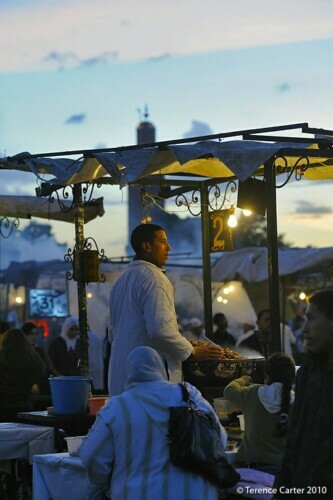 A warning: thanks to more daily flights into Marrakech, mass tourism has well and truly hit the city and the Djemaa Al Fna is world’s away from the square that first mesmerised us more than ten years ago. 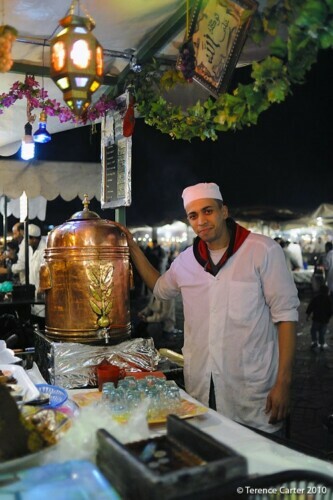 While you’d think more tourists would mean more wealth to go around, the stall touts have become more competitive and more aggressive, and everyone seems set on relieving you of your dirhams. Take little with you — leave your backpacks and handbags at the riad, and don’t wear a moneybelt (you may as well paint ‘rob me’ on your forehead) as there are pickpockets galore. Step back from the crowd and you’ll easily spot them — they’re the guys with their eyes on people’s butts. Take small change — carry pockets full of change, especially 1, 5 and 10 dirham coins, so you’re fumbling through your wallet or having to pull out large notes. 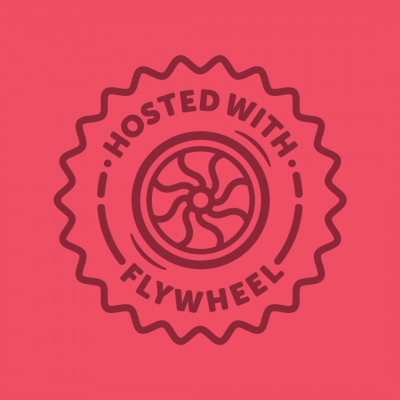 Prepare to pay for photos — be prepared to hand coins over for photo ops, whether you obviously took a photo of someone or not — if you snap a pic of the storyteller while you think he’s busy entertaining the crowd, don’t be surprised if he stops mid-sentence to come and demand his photo fee. They won’t hesitate to ask to look at your photos on the camera’s display! 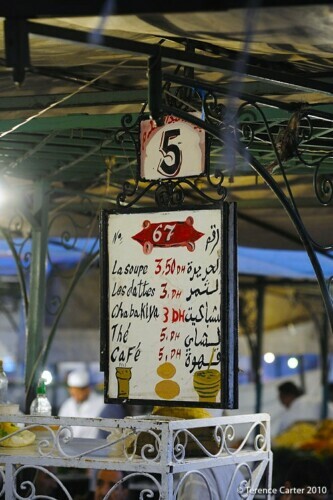 What to tip — a few dirham coins are enough for the gnaoua guys or monkey handlers who force the silly hats/monkeys onto your head, no matter how much they press for more. Don’t be intimidated into paying for something you didn’t ask for. If they get too much, firmly say “safi!” (enough). 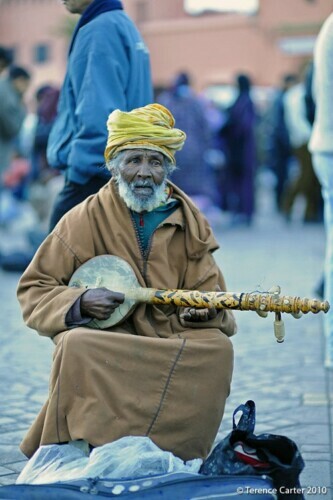 A five-dirham coin is appreciated by the musicians, and if you make a nice portrait of someone ten dirhams is fair. Yes, carry lots of coins when at the Djemaa. I have a video of this very enigmatic storyteller at the Djemaa (shot at night). His skin was black like carbon, and he wore this royal blue djellaba with gold trims and a white head wrap. He was speaking (in Arabic, of course) with such fiery passion that I imagined him retelling stories similar to “One Thousand and One Nights”. 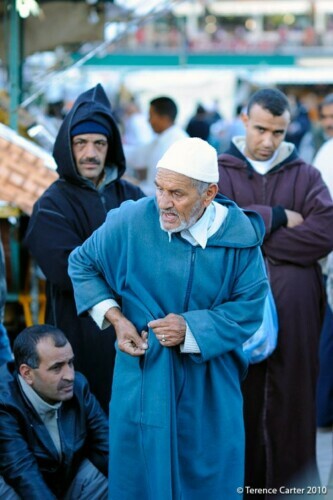 Of course I have no idea what he was talking about, but my imagination was definitely running wild in Marrakech! I love it at the Djemaa! Missed this comment of yours at the time, Jen. Thank you! Would love to see that video.